Frequency Modulation synthesis, modulation of a sine wave creates unique combinations of partials to produce different types of sound. Stanford’s Center for Computer Research in Music and Acoustics. 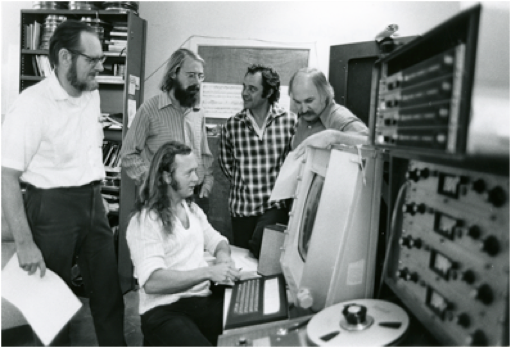 CCRMA (pronounced “karma”) has its roots in a small group of programmers and musicians working in Stanford’s Artificial Intelligence lab in the 1960s. This was all in an era where computers were scarce and programs were still written on punch cards. Since CCRMA’s official establishment in 1975, it has played a key role in developing the now ubiquitous nature of digital audio. “As someone plays music on a computer, plunks keys on a keyboard, or streams songs over the Internet, chances are good that a CCRMA alum or partner is involved in some way. In fact, back at Stanford, this technology would drive CCRMA’s early success through a long and fruitful partnership with Yamaha. In 1975, Yamaha licensed the technology from Stanford and quickly incorporated it into their DX7: the first FM synthesizer. This synth was the basis of a sonic revolution. Musicians such as Phil Collins, Tears for Fears, Michael Jackson, and Queen have all utilized FM synthesis in their music. Still today, this Stanford invention permeates music without the public’s knowledge. Through this partnership established with Yamaha, total Stanford profits climbed to $22.9 million. This is the fourth highest revenue Stanford has made off of any invention or company.